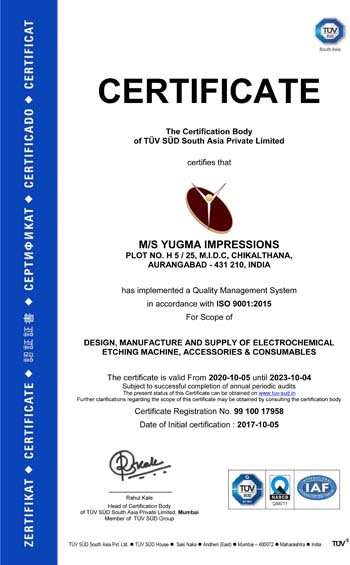 Yugma Impressions, established in the year 2004, is a leading Manufacturer, Supplier of electrochemical etching machines, and consumables like electrolyte, marking head, photographic stencils, etc., which enable our clients to mark their products aesthetically, permanently and cost effectively. Numerous ferrous and non ferrous metallic items and other materials such as cutlery, taps, drills, hand made and automatic tools, crank pins, engine valves, surgical and medical instruments, bath ware, sanitary hardware, ball bearings, gears, engine components, etc. can all be marked through consumables like stencils and electrolyte. The company renders customized solutions for both automatic and semi-automatic processes that suit respective applications. We have successfully accomplished complete plant automation projects for chemical etching process used in marking numbers, emblems, logos, dates, serial / batch numbers and several other data, on various components of different applications and size. The company also undertakes Job work for Laser Marking and Chemical Etching, as per client specification and requirement. We developed this process in response to the growing needs of cross section of industries that require to mark metal components without the stress and strain associated with conventional marking like steel stamping. Quality aspect is given prime importance at Yugma Impressions. The company has achieved phenomenal growth with each passing year because of the quality and durable products that it offers. Rigorous quality procedures are followed right from the process of procuring of raw materials, till the final delivery of the products. Several quality tests are performed during the manufacturing process like Leeb hardness test, shore hardness test, Brinell hardness test, roughness test, digital Rockwell hardness test, Vickers hardness test, ultrasonic flaw detection, etc. to ensure durability and smoothness of operation of the products. Only the flawless machines are then made available to the clients. We operate from a most modern state-of-the-art unit, where safety and health of the staff is considered very important. Yugma Impressions' fully networked workplace is embedded with data centralization to help employees save time by giving them the information regarding the particular assignment along with time limit. Continuous upgradation of technology and machinery is a common practice in the company's setup. We are outfitted with technologically advanced machinery to carry out a smooth production of products. Our remarkable standards in designing the products has helped us earn a significant place in the industry. Very high precision methods are adopted during the production by our experienced and skilled workforce in the most modern factory. The large warehouse owned by us helps us stack bulk products to meet unforeseen market demands.